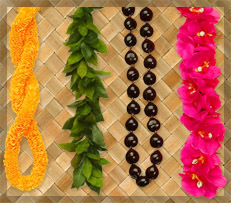 luau by giving your guests and those special to you the best Shell & flower lei’s in the world. Order Direct From Us Today! Complete your luau experience with a lei. We purchase shell leis in large quantities and pass on the savings to our customers! Orchid and Ti Leaf leis are longer lasting and will keep you happy. We recommend staying away from leis that contain plumeria as they are not durable flowers. Buy direct from Hawaii. These high quality replicas of the real thing stand the test of time. You will be able to relive your luau memories with these perpetual leis. Buy direct from Hawaii. Note: Flowers lei’s are seasonal and price may depend on availability. 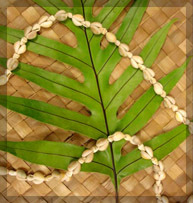 Actual single strand shell leis may vary from the picture above. The lei custom was introduced to the Hawaiian Islands by early Polynesian voyagers, who took an incredible journey from Tahiti, navigating by the stars in sailing canoes. 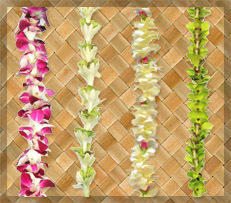 With these early settlers, the lei tradition in Hawaii was born.Leis were constructed of flowers, leaves, shells, seeds, nuts, feathers, and even bone and teeth of various animals. These garlands were worn by ancient Hawaiians to beautify themselves and distinguish themselves from others. Unpack your lei as soon as it arrives. If it seems dry, mist with water. Do not soak or over water your leis. Keep cool or refrigerate until it is to be worn. don’t settle for less get your Hawaiian flower leis direct from the Islands!! !